If you’re at the point where just trying to figure out how to get from the airport to some of Honduras’ most notable attractions, then you’ve made the intelligent decision to ignore any warnings to not travel to this part of the banana republic and you are ready to experience all it, and its people has to offer. There are a lot of places worth visiting in Honduras. Maybe you want to see the island of Roatán, Lake Yojoa, or possibly a few sights near to the modern capital city of Tegucigalpa. This travel tip however is solely to help you get from Ramón Villeda Morales International Airport in San Pedro Sula to one of the countries most endearing and historically signiffitcate towns, Copán Ruinas. Arrival Tip! When you arrive to the airport, have about $50 - $60 changed into local currency. Make sure you check the exchange rate before you arrive, but don’t worry! Currency dealers are legit and won’t take advantage of you. We promise. Head out to the mob of taxis and start accepting offers. All city cabs are white and have similar numbering on the sides. Do not let go of your bags right away as some drivers might try to pressure you into their cab. They wont’ steal your luggage, but politely say ‘no’ and ask how much it will be to get to the central bus station, or in Spanish, “por cuánto a terminal Metropolitana?” It should be around $15 - $20, or roughly 400 - 500 Lempiras. Can you haggle? Sure, offer 400 LP to get your trip for 450 depending on the day. Most importantly, DO NOT get into the cab until you’ve agreed to the fare. Now that you’re all set, If you’re lucky enough to be traveling with 1 or 2 other people, allow one of your group find their seat while the others help the driver put luggage into the trunk. Once you’re locked and loaded, enjoy what will likely be a crazy ride across town. Friendly tip! Non-Central American travelers are the least likely to be targeted for any kind random acts of crime or violence. Which is sorta odd if you think of it since you’re a easy mark. Taxis are safe but I do suggest just not using your cell phone during your ride. Once you arrive, don’t get out until your driver has also hopped out to remove your bags. Pay the agreement amount, say “gracias,” then head into the labyrinth they call a bus station. You’ll notice right away how ridiculously massive this bus station is. It has shops, a massive food court, then dozens of bus carriers feeding people throughout Honduras as well as neighboring countries in Central America. It is a safe place with security at every corner, but as always when traveling through Latin American, keep your personal belongings close to you and limit your electronic device usage to only in the waiting area of your chosen bus carrier which are away from congested public spaces. The trip to Copán is treacherous in a car, in a bus it’s even worse. It you get any kind of motion sickness, take some motion sickness pills with you and dose up before you board. High-end Non-Stop Buses: Hedman Alas is your best option and has the AWOL stamp of approval from real world experience. It’s like flying in a airplane, and for $30USD, you can sit up front in a very large fully reclining chair. You can even book online which is pretty handy! It should take about 3 hours, but can easier turn into 4 depending on traffic and construction so you might as well make the journey in comfort. It does not make any stops along the way which is considered a safety perk! The Chicken Bus Experience: If you’re looking for a more affordable option that gives you a truly authentic experience of Latin American travel culture, then look no further than Casasola Express. We’re kinda joking that this is a chicken bus because it is a few steps above such folk lore. A true Chicken bus is a good ole North American yellow school bus—turned public transportation and yes, people bring their chickens along for the ride. Casasola is a little bit classier than that and for roughly $10USD, you will be treated to a marvelous experience of traveling through the Honduran countryside via bus. Their website says you’re getting a direct trip from San Pedro Sula to Copán Ruinas, but that is a load of crap. This bus will stop more times than a Brooklyn bound local train in New York City. That said, you’re going to really see how marvelous the social ecosystem is in this country. Street vendors jump on board to sell you snacks and drinks, the bus ‘attendant’ if you will, helps load and unload passengers sometimes without the bus coming to a complete stop. The bus even serves as a parcel service, picking up and delivering packages along the way. I’ve even had a drunk clown jump on board for a couple miles and put on a show up and down the isle for tips. All of this comes at a price, and it isn’t the ticket price since that is nearly a 1/3 less than Hedmans. What you’re getting is a very long trip (5-6 hours) in a un-air-conditioned bus with cramped seats. That said, everyone is nice and helpful, it’s just different from what most North Americans will be accustom to. Is it worth it? Yeah, kinda. Do it once then take the higher end buses from then on. Copán Ruinas is literally the end of the road. 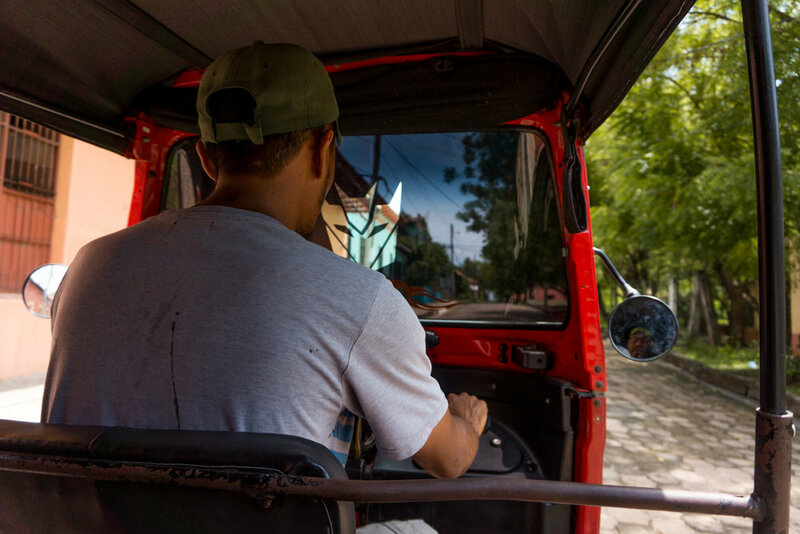 Once you arrive you have two options, walk, or catch a moto-taxi. If you have any rolling style suitcases, just grab a moto-taxi. Tell the driver the name of your hotel and you’ll be set. It’s about 10-20 Lempiras per person per trip. Not that pricey at all. If you have backpack style luggage, just walk. Walking is a good way to build trust if you have any first time visitor jitters traveling in the literal, most dangerous county on earth. However, you’ll find in this cute little town, you can safely traverse at all hours of the day and night without any major worry of harassment. Copán really cherishes the tourism they get. You’re safe here. Are you Disney World safe? No, don’t be so naive. That said, you can safely walk everywhere, carry cameras out in the open, use cell phones out in the open, and not have a death grip on your bag or purse. If Copán Ruinas was your only stop in Honduras and you’re just headed back to the airport, just do everything in reverse. Remember, traveling in places like Honduras is safe and you’re no more likely to have a bad experience caused by crime or otherwise than you would in any other major city in the world. Turn up your situational awareness and use common travel-sense and you’ll have a great time. ¡Buen viaje! Johnson City Press Goes AWOL.